Hello, Friends we are back with another Giveaway after a long time. It is very easy to get free recharge. So all the techocious reader just follow the steps. 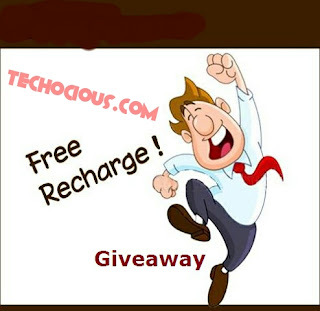 As you all know that here is free recharge festival we are giving free recharge to top 5 commentators on random posts, and I will continue to do that. Any Random 1 commentator will get 500 rs. Free Recharge. First Top 3 commentators will get Rs.50 Recharge each. WHAT TO DO TO BE ELIGIBLE THIS GIVEAWAY? Result will be announced on 18 Sep 2015. Winners will be selected random. Note- Any type of spam comment will not be tolerate the result of free recharge can be changed. Don't forget to share this post with your friend.